From the New York Times bestselling author of Rump, comes the true story behind another unlikely hero: a grumpy dwarf who gets tangled up in Snow White’s feud with the wicked queen. 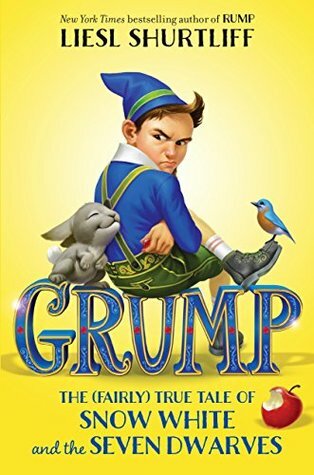 Grump: The (Fairly) True Tale of Snow White and the Seven Dwarves by Liesl Shurtliff is a middle grade fantasy retelling of the classic Snow White and the Seven Dwarves. The story brings to light the saying of there’s three versions of every story, his, hers and the truth. This is Grump’s truth of what really happened. Dwarves are generally born deep underground and feed upon the rare gems that they mine beneath the earth. However, when it was time for Borlen to enter the world his parents were close to the surface due to a collapse so along he came away from the normal depths for a dwarfling. This closeness to the surface became an obsession with the little guy as he grew with a crazy fear of the depths that the other dwarves enjoyed. When Borlen got older his parents worried about his fitting in with those of his kind so they pushed for him to join a mining crew early. As Borlen took his place with six other dwarves on the crew he gained the nickname Grump due to his distaste of the job. His obsession with the surface only continued regardless though and one day Grump found his way to the top…. Grump was such a cute little version of the classic story from start to finish. You have the basic events that we all have known and loved all happen from a totally different prospective giving the story a whole new feel. Apparently the author has several other books done in this manor that I will definitely have to check out after enjoying this grumpy little gem of a story. A fun and fantastic twist to Snow White that I definitely recommend to all ages. Liesl Shurtliff is the author of the New York Times Bestseller RUMP and other (Fairly) True Tales. She was born and raised in Salt Lake City, Utah, with the mountains for her playground. Just like Rump, Liesl was shy about her name, growing up. Not only did it rhyme with weasel, she could never find it on any of those personalized key chains in gift shops. But over the years she’s grown to love having an unusual name—and today she wouldn’t change it for the world! Before she became a writer, Liesl graduated from Brigham Young University with a degree in music, dance, and theater. She now lives in Chicago with her husband and four children. I don’t remember seeing this on NetGalley but it sounds adorable. Wonderful review Carrie! I would be glad if you gave a review (On Amazon) in comment session after reading my book on Amazon.. Sorry, I have a stack a mile high of books given to me to review that I don’t buy any myself. Well, I can’t really tell you if your description is fitting to the book without actually reading the book. I can tell you however that having someone help with editing would be highly recommended. Just in the first sentence alone there are several errors which would be an extreme turn off to me when it came to reading the entire book. In the world of mist and confusion, We think our decisions does not affects the lives of others. But rarely do we acknowledge that our One Decision, can make Or destroy many lives. In the world of mist and confusion we think our decisions do not affect the lives of others but rarely do we acknowledge that any one decision can make or destroy many lives. I’m not a writer or editor however so you would be much better off to have help with someone qualified to do so. I requested this as soon as it came on Netgalley, but I am still waiting. Awesome review. This is one I hope get a chance to read, even if I have to buy it myself. I have read a couple of the other ones Liesl Shurtliff wrote.